Hey, guys. 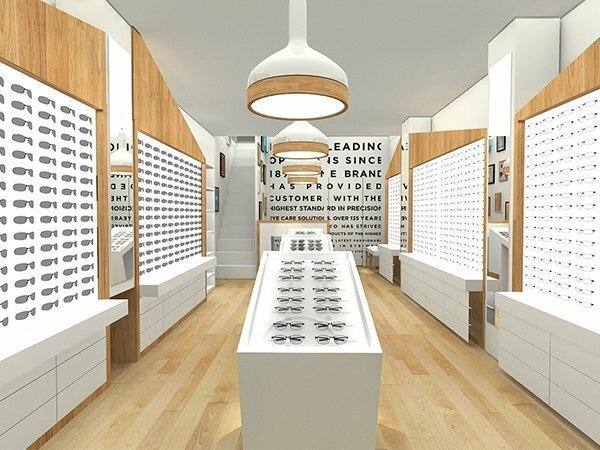 are you looking for good optical store design? are you still worried can’t find suited optical display fixtures? today you will find what you want. in this article what I wanna share is a very modern optical store fixtures design. if you’re interested to start your own optical shop store. please follow me see more details below. More information about this optical store. Size: 30sqm. or customized based on your store layout. Color: white, brown wood grain. Material: MDF, plywood, fire prof plate. As you see this optical store, basic tone is white and brown wood grain. match brown color wood grain floor. it’s very high-end and modern, as you see the whole optical store two sides is 2.4migh Acrylic trough wall display. backsides hidden led light strip, the bottom part with many drawers for storage. you will find here have many mirror match, it’s very nice for the customer to try on glasses. 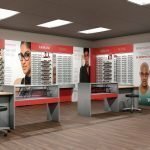 how to order an optical store like this one? At first, you need to contact us and share all of your ideas . such as shop size, your like color, your logo etc . then we can help you make a new design and put all of your ideas on it. submit the design to get the mall approval . after we confirmed the design, we can start work on this kiosk drawings and production it, usually build it about need 20-22 work days, During the production process, we will take photos to update the progress . the last step is package and shipment it to your port . if you need we also can direct send this kiosk to your address. Assemble this optical shop is very easy and fast. It can be assembled quickly even without any experience. before we production this store. make construction plan . you can see this kiosk will be cut to some reasonable part. put an ordinal on it, like 1, 2 , 3 , 4 …. when you received the kiosk . you just need to put each part together and connect the wire is ok . Thanks for your time and reading . The unique kiosk as a direct manufacturer, we mainly work on the design and customized different types optical shop and optical display fixtures, if you want further info or interested to build an optical store like this one, for more related design, pls check our optical store fixtures page. welcome inquiry!